So this is the first beer I have chosen to review for a couple of reasons; first, it’s officially summer and nothing says summer like strawberries and second, this beer literally stopped me in my tracks when I saw the description in the window of a local restaurant. I love white beers and I love fruit beers so combining the two makes it twice as great right? Well short answer yes with an ‘if’ and long answer no with a ‘but’…this beer looks amazing in the glass a dark pinkish colour and very effervescent. It smells wonderful as well. It is easy to drink and excellent when served very cold. It is quite sweet and light on the alcohol, basically if beer was a made into a cocktail it would be Früli. To be honest I would be hard pressed to label this a beer during a blind taste test. At first swig I thought I would never tire of drinking this beer however I soon found that I had a tolerance for about two before I started to feel a little overwhelmed by the sheer sweetness of it. Additionally, I did not find this beer paired well with food (or at least the foods I was consuming at the time things somewhat more savoury and acidic). I have had this beer in draft form and by the bottle and while there is no a huge discernable difference I slightly prefer the draft form. This is the perfect après or after dinner sipper best enjoyed on a hot night after a long day at the beach and sitting on a patio surrounded by beautiful smelling flowers. Two years later and I am looking back at this post and thinking, well, what was I thinking? I cannot believe how much my beer tastes have changed in two years; the evolution of the beer geek merits scientific study or at least a PhD dissertation. 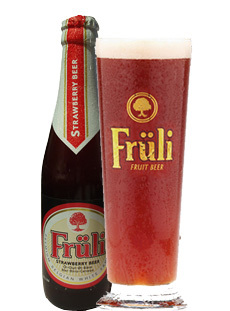 It is not that I hate fruit beers or that I think Früli is too trendy but I just no longer like the taste -too sweet, too light and too strawberry. As a gung-ho enthusiast two years back I bought an entire case from the BC liqour store thinking I would never tire of this beer. About one third of my way into the case, and countless craft brews later, I was trying to figure out ways to alter Früli to make it more palatable. Lo and behold I found out that a touch of Fruli went lovely with a robust coffee/chocolate stout and added a touch of sweetness to a crisp lager or pils. So thankfully my case was not a total write-off. Looking back I find my original post pretty amusing but also immensely useful in charting how my tastes have developed along certain lines leading me to finally feel secure in knowing what it is I like and more importantly what I want in a beer. What beers were your first loves? How do you remember them tasting? How do they taste to you now? So lately I have been looking at my fridge and feeling a sense of been there done that with regards to my beer selection. I have tried the standards (classic ales, lagers and pilsners), sampled the varieties of styles (lambics, barley wines, IPA’s, ESB’s, white ales, sours, stouts, porters), branched out to the one-offs (chocolate mint, oyster stout, cookie beer), sipped the spectrum of brewing methods (trappist, casked, cellared, draft) and come full circle to my beer roots (ahh Belgian Beer) but as any serious beer lover needs to ask now and then I wondered now what? Well aptly enough the answer came from the very fridge, which was causing my ennui; I saw a lonely little Fruli hanging out with the remainder of my winter stouts and this got me thinking why not try mixing some beers together? strawberry when you take a sip and, in fact, the kick of the stout does not hit you until well after you have finished an entire glass. The colour and clarity of the stout remain after mixing and the head is pretty much negated. These two beers really bring out the best in each other. I find the Fruli too sweet on its own lacking in beer taste if you will -bordering on a cooler- while the Brooklyn is almost too strong for me unless it is a particularly nippy winter’s day and I am cuddled up in front of a roaring fireplace with a good book. This combination really makes the stout a viable summer option. 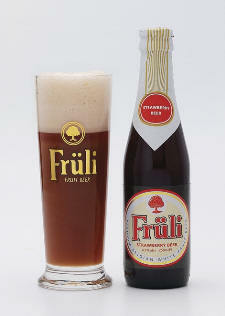 Früli “A high quality Belgian white beer blended with pure strawberry juice”. So this is the first beer I have chosen to review for a couple of reasons; first, it’s officially summer and nothing says summer like strawberries and second, this beer literally stopped me in my tracks when I saw the description in the window of a local restaurant. I love white beers and I love fruit beers so combining the two makes it twice as great right? Well short answer yes with an ‘if’ and long answer no with a ‘but’…this beer looks amazing in the glass a dark pinkish colour and very effervescent. It smells wonderful as well. It is easy to drink and excellent when served very cold. It is quite sweet and light on the alcohol, basically if beer was a made into a cocktail it would be Früli. To be honest I would be hard pressed to label this a beer during a blind taste test. At first swig I thought I would never tire of drinking this beer however I soon found that I had a tolerance for about two before I started to feel a little overwhelmed by the sheer sweetness of it. Additionally, I did not find this beer paired well with food (or at least the foods I was consuming at the time things somewhat more savoury and acidic). I have had this beer in draft form and by the bottle and while there is no a huge discernable difference I slightly prefer the draft form. This is the perfect après or after dinner sipper best enjoyed on a hot night after a long day at the beach and sitting on a patio surrounded by beautiful smelling flowers.